GetDivorcePapers.com provides professionally completed, 100% court-approval, money-back guaranteed Wisconsin divorce forms. Just create an account, complete the interview, and file for divorce. Our case managers do all the work for you, and send the completed Wisconsin divorce forms when they are ready to be filed. It is mandatory for either of spouses to be resident of this state for 6 months prior to file for the divorce case. Further, the same person has to be living in the county immediately one month before filing the case. There is a time period of 120 days in this regard that starts once the defendant gets the papers. Separation between the spouses for 12 months without any cohabitation. Joint petition can be submitted by both spouses in this ground in order to get the divorce. Whatever the reason it is, both the spouses are required to agree with it and must validate it later on. Following factors help in determination of the child custody either on sole parent based or joint custody. Flexibility in the settlement of child. Health conditions and medical fitness of all individuals involved in the decision. Association of child with parents and other members of family. Observation of a neutral moderator. Drunkenness observed in either of parents. 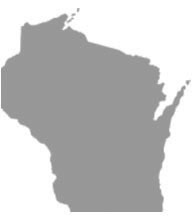 Wisconsin is considered to be a state of community property. It divides all the marital property of spouses in two equal halves. It does not consider the distribution of separate properties held by both spouses or any other gifts and inheritances. Following are the determinants for distribution of property. Role of each spouse in acquisition of marital property. Worth of each spouse's separate property. Age and physical conditions of spouses. Occupation and employment history of spouses. Time required by the spouse seeking for support to get education, skills and training for the employment. Total time that the marriage carried on. Financial strengths of both spouses and their economic stability. Tax obligations on both parties. Time that either of spouse remained absent from the job market. Any other mutual agreement between the spouses. Court may take the spousal support and child support under one account of family support section. Any expense related to the extraordinary transportation of child. Tax liabilities on both parents. Any daycare cost that the custodian parent has to pay. Official guidelines for the child support have been formulated by the state that is utilized to determine the amount. However, if this amount comes out to be unjust for either of parents, then courts may reconcile their figure to come up with a fair one. Courts have the rights to suggest mediation for both of spouses if it feels the chances of reconciliation. Moreover, if the issue of child custody is involved, then this mediation becomes essential for both the parents. Request for the mediation can also be made from either of parties. There is no need of a lawyer when applying for divorce in the state of Wisconsin. A divorce case which is filed without any help of an attorney in any of the states is known as Pro Se Divorce. Literally, Pro Se is a Latin phrase and it means "on her or his own". Process of getting the divorce without the help of lawyer may vary from one State to another. These types of divorces are perfectly legal and enforceable in Wisconsin, and are actually very convenient. Usually, once settlements have been made regarding property distribution and custody matters among the spouses in case of a mutual divorce, Pro Se Divorces are filed.